tengo que realizar la configuracion de stp con 2 vlan, en 4 switches que estan conectados en forma de un anillo . If we are talking about RSTP (802.1w), I think you miss carrier VLAN ID. 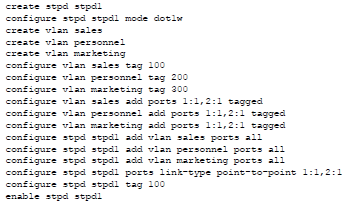 Carrier VLAN is the one that will carry STP BPDUs. See an example from EXOS User Guide in the image attached. It's more than enough, but we will be able to walk through the analysis of RSTP status in your network together.